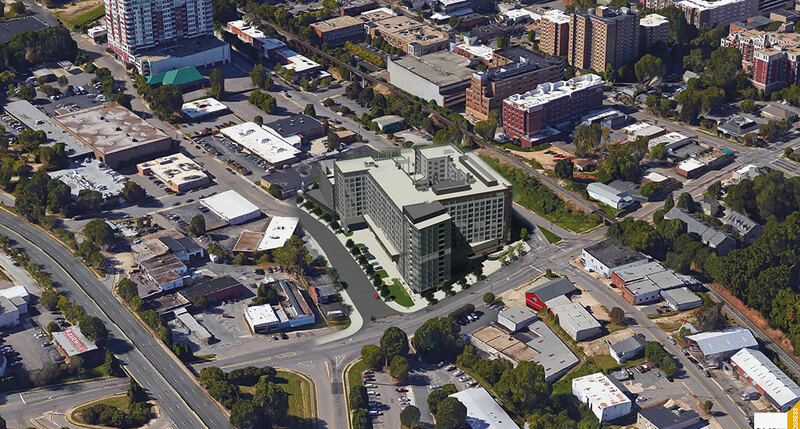 John Kane and Cross Williams, the Raleigh developers behind the proposed 12-story Smoky Hollow building project at the corner of Peace and West streets, have quietly been making even bigger plans for an already ambitious project for downtown Raleigh. Kane confirms that he and Williams have been assembling more land around the 4.2-acre Smoky Hollow site, but he says no firm development plans are in place yet for any of the new properties. County real estate records show that entities controlled either by Kane or Williams paid close to $15 million in November and December for land that would nearly double the total acreage of the project so far. Since 2008, the partnership has paid a combined $21.4 million for buildings and lots in the neighborhood bound by Peace, West, Johnson and Harrington streets that encompass their Smoky Hollow project. The project’s name is a nod to the historical blue-collar neighborhood that used to occupy that area of Raleigh before redevelopment efforts took over in the 1960s. Development plans for the first building at Smoky Hollow was approved by city planners in December and includes allowances for up to 616 apartment units and a 51,300-square-foot grocery store. Real estate sources say that Kane Realty Corp. and Williams Realty & Building Co. are close to a deal with Publix Super Markets to anchor the building, which will likely be downtown Raleigh’s first grocery store. Kane, who is best known for his development projects at North Hills, is also developing the $150 million The Dillon mixed-use project in downtown Raleigh’s Warehouse District. The Dillon is expected to be complete in early 2018.